"Understanding the disengagement process may have very practical implications for countering violent extremism," John Horgan said in his presentation "Disengagement and De-radicalization from Terrorism." 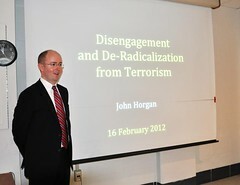 Horgan, a researcher for the National Consortium for the Study of Terrorism and Responses to Terrorism (START) and director of the International Center for the Study of Terrorism (ICST) at Pennsylvania State University, discussed his current project, a three-year international research program called "Pathways, Processes, Roles and Factors for Terrorist Disengagement, Re-engagement and Recidivism," during START's spring seminar on Feb. 16. While the process of radicalization into terrorist organizations has garnered much attention among academics and policymakers, very little attention has been paid to the factors that prompt individuals to withdraw from violent extremist or radical groups. Building on those conclusions, Horgan's current project aims to advance society's understanding of the disengagement and de-radicalization processes: How do people disengage? What are the critical tipping points? What are the post-disengagement trajectories? And what might de-radicalization look like? He and his team plan to analyze approximately 130 autobiographical accounts of disengagement and conduct 30 semi-structured interviews with disengaged individuals during the course of the study. "Ultimately, we want to help develop a deeper understanding of the psychological processes inherent in how and why people move away from terrorism and identify practical and applied lessons for operational implications," Horgan explained. "These might include providing an evidence base for thinking about risk assessment of terrorist offenders, as well as the design and evaluation of terrorist de-radicalization programs among many other practical issues." Horgan has authored more than 60 publications, including "The Psychology of Terrorism (2005)," "The Future of Terrorism (1999, with Max Taylor)" and the forthcoming "Divided We Stand: The Strategy and Psychology of Ireland's Dissident Terrorists (with Oxford University Press)." He is a member of the editorial boards of Terrorism and Political Violence, Journal of Investigative Psychology and Offender Profiling, Behavioral Science of Terrorism and Political Aggression and the Journal of Strategic Security. Horgan is also a member of the Research Advisory Board of the FBI's National Center for the Analysis of Violent Crime (NCAVC). He holds a doctorate and a bachelor's degree in applied psychology from University College, Cork.